Our annual Waunakee Rotary Lights event will start Sunday, November 27th and run through December 31, 2016. The lights are located at the Waunakee Village Park, 410 E. Main St. The lights will be on from 5pm - 9am every evening. Be sure to get your Rotary Lights Magazine containing coloring contests, trivia contest and more. Link to 2016 Rotary Lights Volunteer Schedule - click the link to download the most current Word document to view the volunteers who are assigned. During the month of December, thousands of families walk or drive through Waunakee’s Village Park to admire the lighted holiday display. The Rotary in Lights is marking its 11th year, and although the massive decorating tasks require lots of time and manpower, local Rotarians, along with other Waunakee service club members, plan to keep the tradition alive for years to come. Before the annual event began, Rotarians had noticed a similar, though much larger display sponsored by the Rotary Clubs around La Crosse. It was Tom Reis, an electrician and Rotary member then, who encouraged his fellow members to pursue the Rotary in Lights at Waunakee Village Park. Rotarian Phil Willems said the event began with just a few light cords and candy canes but has grown ever since. It now includes five golden rings, a gingerbread house, and thousands of glistening lights throughout Village Park. Only one group of figurines has been retired over the years. “The Seven Swans A-Swimming escaped down Six Mile Creek,” joked Bill Erickson, a fellow Rotarian. Like Willems, Erickson is one of a core group of about seven Rotarians who each year maintain the lights, put them up and take them down. Some of the men are in their 70s. Another six or seven individuals also show up to work an afternoon or two. “Over the years, the same crew has made themselves available,” Erickson said. Their expertise and experience allows the work to be done quickly, in about 240 to 300 manhours, they estimate. Over the years, other clubs like the Knights of Columbus and Lions have been helping set the lights up, as well. “We would welcome clubs with members to help,” Willems said. Around August members begin getting together regularly to make any necessary repairs to the lights and replace any bulbs. Then, the first week of January, the crew takes the lights down. “They always come down faster than they go up,” Erickson said. Other challenges occur when connections get wet, Erickson and Willems said. They spent a recent morning checking the bulbs before finding a wet connection and drying it off. Willems also reset 14 timers to accommodate a crew from Channel 15 WMTV, when the news station decided to highlight the park for its 4:30 a.m. segment. Three years ago, Wisconsin winter was at its most severe, and the crew was unable to recover all of the cords until April, they said. They’ve learned over the years to keep the ends of cords out of the snow. Over the years, Rotarians have built their own additions. Bob Ziegler created giant reindeer and several other additions. Ziegler, who passed away in August of 2014, envisioned a ferris wheel at the park, as well. Ray Statz built the Gingerbread House, and another community member built the warming hut for the greeters. Rotarians also credit the Village of Waunakee’s help, particularly Waunakee Utilities and the parks and recreation department. Not a lot of costs are associated with the display, so with greeters collecting donations at the entrance, it is the club’s largest fundraiser. It also provides funds for other service clubs who help set up, such as the Lions and Knights of Columbus, along with high school groups such as Pay It Forward and sports booster clubs who help greet at the entrance. The club also prints a brochure that generates publicity for and advertising revenue from local businesses. 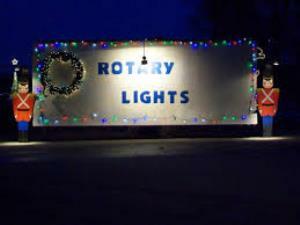 “Rotary Lights does help Rotary help others,” Willems said. The club donates thousands of dollars each year to charitable organizations such as the Waunakee Neighborhood Connection and the Waunakee Food Pantry, not to mention international projects. The comments Rotarians hear from members of the community make the project all the more worthwhile. “One guy comes every night with eight kids in the car,” said Willems. Another woman brings her son who has autism every night, Erickson said. “It’s nice our community can have this,” he added.